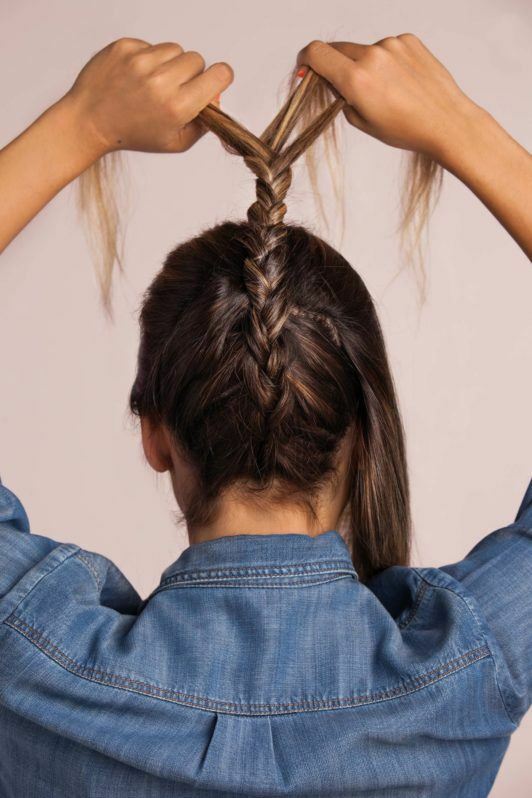 Impress your friends with this upside down French braid. Learning how to French braid your hair upside down sounds like a difficult task, doesn’t it? But what if we were to tell you it’s actually far from impossible? 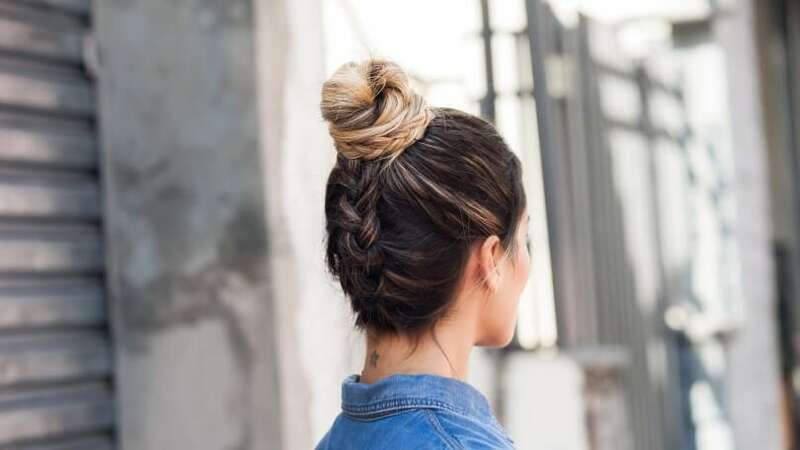 Yes, creating an upside down French braided bun requires a little practice and patience, but we promise, once you get the hang of this technique there’ll be no stopping you! Need proof that it’s not only doable, but also pretty fool-proof? We’ve made it easier for you to master by putting together a simple step-by-step tutorial to help walk you through the process. So what are you waiting for? Read on to discover how to French braid your hair upside down. And just a heads up: once you nail this effortlessly elegant look, it’ll become your new favourite go-to hairstyle. Begin with clean hair: use a wash and care system, like the TRESemmé Silky Smooth Salon Silk Shampoo and Conditioner (500ml, £3.69 each*). This duo uses an advanced smoothing system to help leave your mane smooth and salon-soft. Also, ake sure your tresses are tangle-free to make your braiding easier. Time to begin your French braid at the back! To do this, flip your hair over your head – it’ll make it easier to reach behind your head. Take a small section of hair near the nape of your neck (roughly 2 inches wide), and divide it into three equal sections. Begin to cross the strands once like a typical braid (left over middle, right over middle). Before crossing strands over again, pick up additional hair from each side and repeat the weaving motion to create your French braid. Continue weaving your French braid until you reach about two thirds of the way up the back of your head. 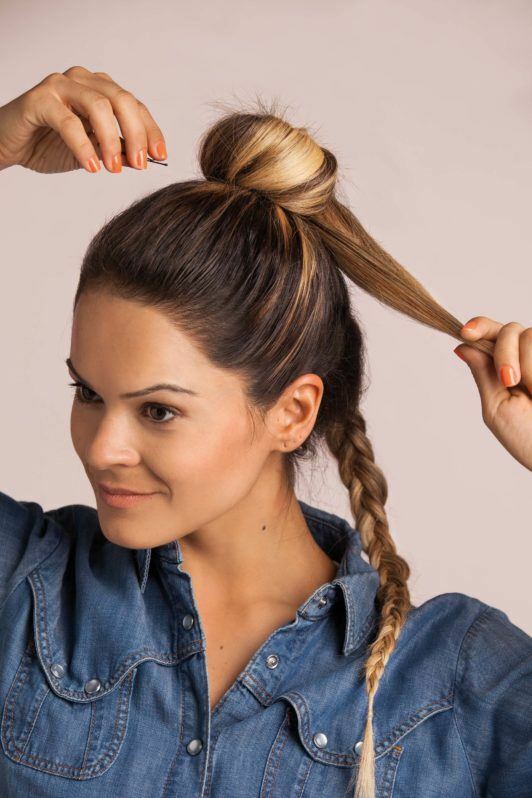 At this point, stop adding in hair from the sides and continue plaiting your hair in a standard braid – you’ll use this to wrap around your bun in the next steps. Finish plaiting your braid all the way to the end and secure with an invisible hair band. You should now have a French braid on the underside of your head, with the rest of your hair loose. 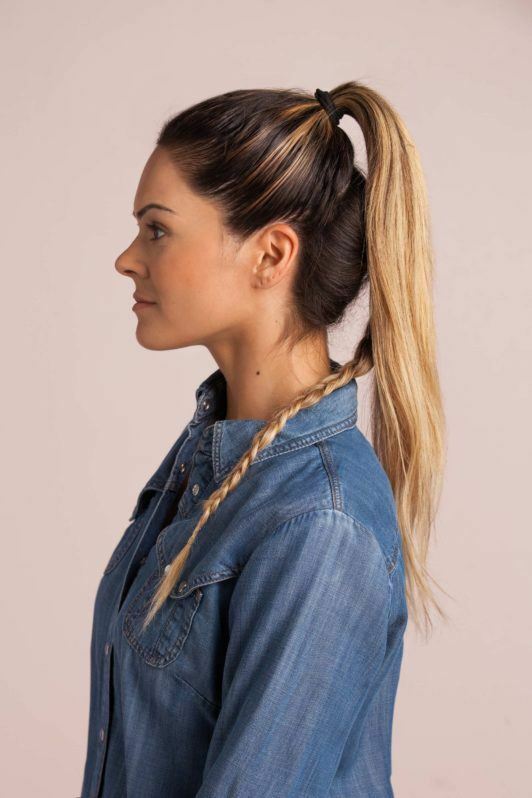 Gather your loose hair, leaving the braid separate, and pull it into a high ponytail. Secure it in place with a snag-free hair tie. 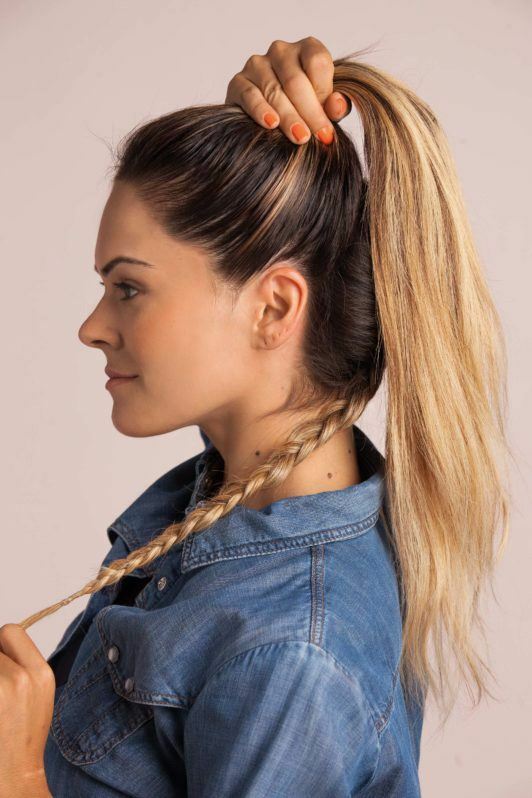 Now, create a bun with your ponytail. Start by twisting your ponytail and wrapping it around itself, then secure it in place with a few bobby pins. 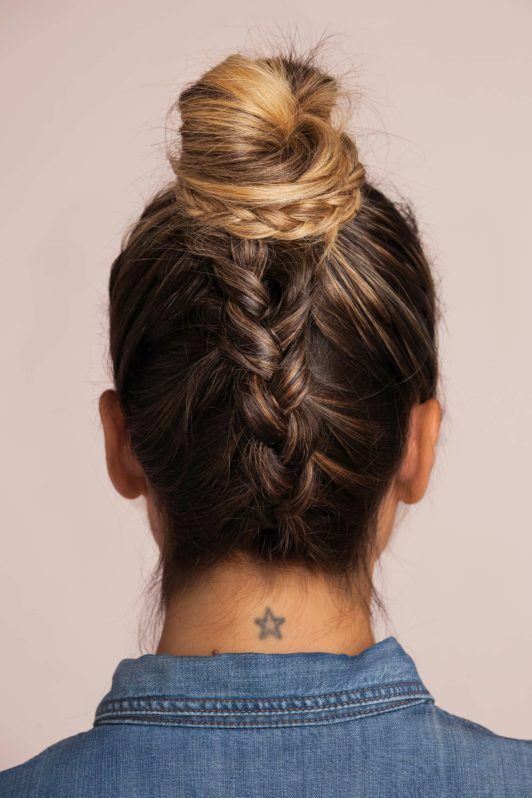 Lift your French braid straight up, so that it’s centred, and bring it towards the front of your head. Then wrap the end of your French braid around the base of your bun and secure with a bobby pin. And you’re done! 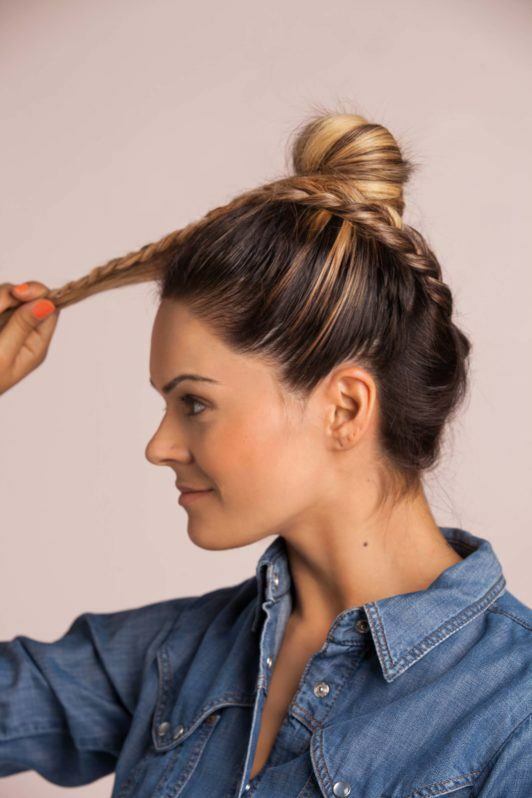 A deceptively simple upside down French braided bun that’s perfect for work or play. To seal the look, lightly spray your ‘do with the Toni&Guy Classic Medium Hold Hairspray (£7.69*) to help protect against frizz and humidity. 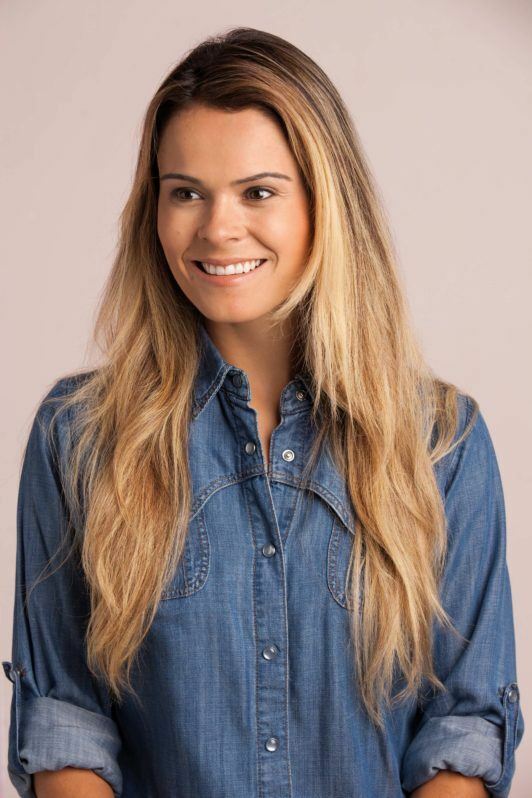 Added extra: you can mist a shine spray (like the VO5 Smoothly Does It Tame & Shine Spray, £3.99*) over your finished ‘do, too, for further glossiness! So now you know how to French braid your hair upside down, there will be no stopping you!